The D3 psych sheets are out, and the meet is fast approaching. It’s time to get an idea of which teams are well positioned to take the title. Joan Lluís Pons se lleva el Swammy al mejor nadador español de 2018 gracias a su medalla en el europeo de Glasgow. Hugo González y César Castro, menciones de honor. 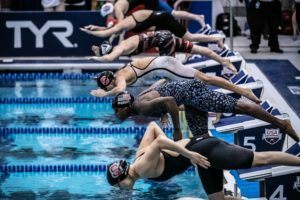 Watching Swimming: What Makes a Race Good? 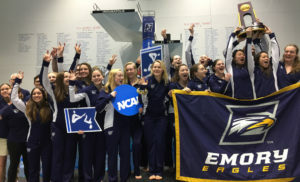 Last Friday, SwimSwam published our Swammy Awards Top 10 Swims of the Year. 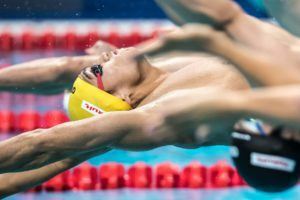 The number one race was the men’s medley relay at the Asian Games. This month, we’re recounting the top performers and performances of the year 2018. Keep track of all of our Swammy Award winners here, with links out to full Swammy Award stories and honorable mentions. 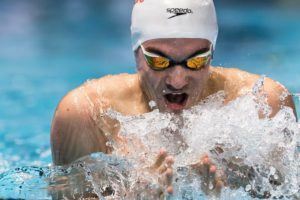 As we wrap up our 2018 Swammy Awards, it’s time to look back at the top 10 swims of 2018. Zach Yeadon of Notre Dame will swim the men’s 1650 on the final night in Columbus. Ali Galyer swam the fastest 200 back so far in the NCAA season this morning at the Ohio State Invite. Stanford’s Taylor Ruck will swim a double tonight at the Ohio State Invite in the women’s 200 free and 100 back. Asia Seidt clocked 51.25 this morning in the women’s 100 backstroke, the 2nd-fastest time we’ve seen so far this NCAA season. Brooke Forde (500 free) and Ella Eastin (200 fly) come into tonight’s finals at OSU as #1 seeds. 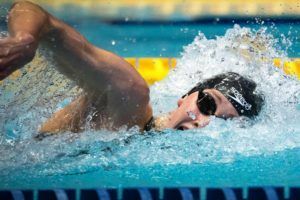 Ella Eastin will be among the Stanford women’s contingent heading to the Ohio State Invitational this weekend. Taylor Ruck broke a pool record and won two individual events as the Stanford women improved to 2-0 at Washington State. National Junior Team member Alexandra Crisera has verbally committed to Stanford University for 2019-20. Rising international star Taylor Ruck headlines a dominant Stanford class atop our incoming recruiting class ranks for 2018-2019. Emily Weiss lowered the 100 breast Jr. Pan Pac Championship Record for a second time to win gold on day 2 in Fiji.